Preparing the Rice: Wash rice and drain out the excess water. In a non-stick pan heat 3 tbsp ghee and add cinnamon, cloves and cardamom and sauté for few seconds and add the rice. Stir continuously on high heat for 2-3 minutes. Add boiling water and salt, stir well and cook covered on low heat until the water has been absorbed. Gently stir the rice with a fork and keep aside. Preparing the Chicken Korma: Cut chicken to medium pieces and clean properly. Mix ground ingredients in ½ cup yogurt and marinate chicken pieces in this mixture and keep aside for 1 hour. Heat 4 tbsp ghee in a non stick pan. Add chopped onion, ginger and garlic and sauté till golden brown. Add cinnamon sticks, cloves and cardamom and sauté well. Into this add marinated chicken pieces along with the marinade, salt and green chillies and sauté well. Add little boiling water and cook till the chicken pieces cooked thoroughly and the gravy thickens. Finally add coriander leaves and mint leaves, mix well and let the curry a nice boil turn off the heat and keep aside. Assemble the Biriyani: Grease an ovenproof baking dish with some ghee. Divide the rice into three portions. Spread one portion to the bottom of the dish. Cover the rice with half of the cooked chicken. Spread another layer of rice on top, and then cover with the rest of the chicken. Finally top the chicken with the last portion of rice. Drizzle some saffron or turmeric soaked in milk and ghee on the rice. Pre-heat oven to 180˚C and bake biriyani for 10-15 minutes or until heated thoroughly. 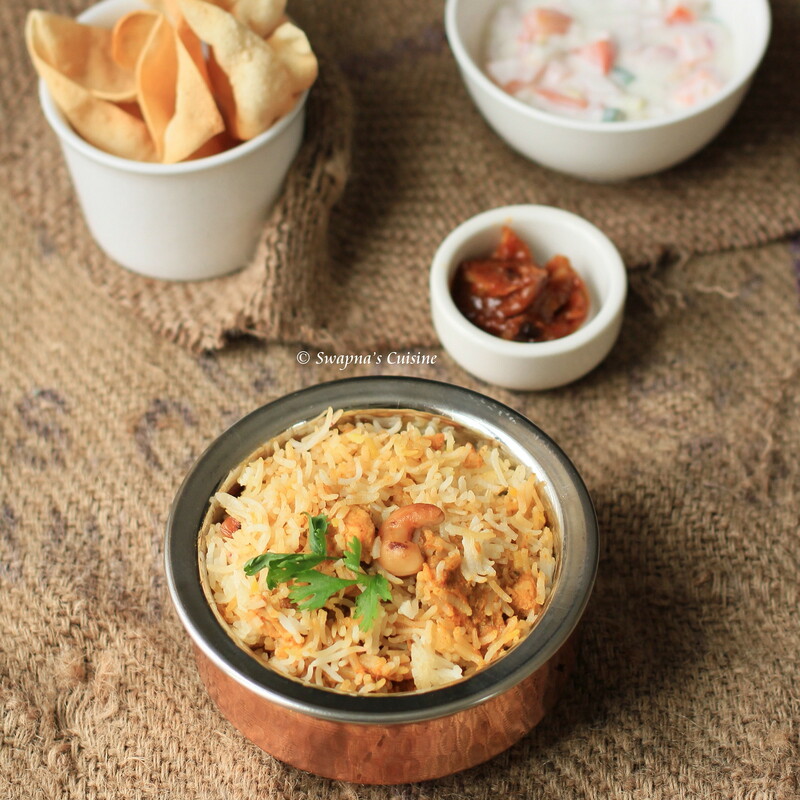 Garnish biriyani with some golden fried onions, cashews and raisins. 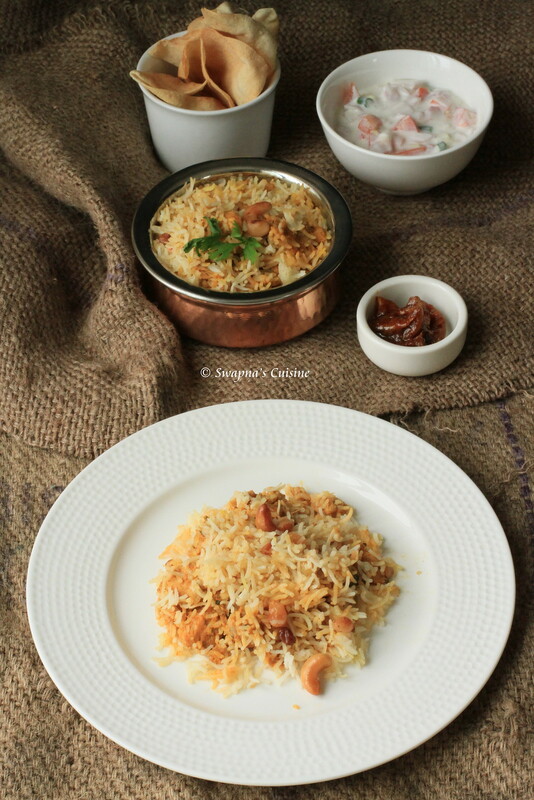 Serve with Biriyani Salad (Onion and yogurt salad), Lime pickle, dates pickle and pappad. Mix everything and serve with Biriyani.